Tyrannosaurus rex dinosaur and meteorites. 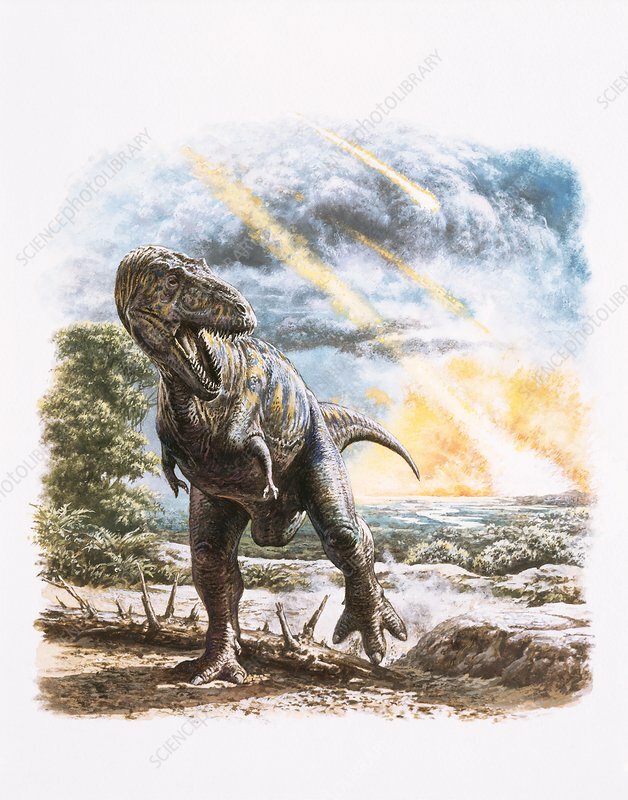 Computer illustration of a Tyrannosaurus rex dinosaur in a prehistoric landscape being bombarded with meteorites. This carnivorous theropod dinosaur lived in North America from about 70 million years ago until the extinction of the dinosaurs some 5 million years later. The head is heavily built, to withstand impacts with prey animals, and has the sharp teeth of a predator. T. rex is thought to have been a scavenger as well as a hunter. Among the largest carnivorous dinosaurs, T. rex was up to 6 metres tall and weighed as much as 7 tonnes.